Full press release after the jump..
SAMSUNG ANNOUNCES WHITE GALAXY S II TO HIT UK SHORES Samsungâ€™s most powerful Smartphone yet now available in white from the 1st September 29 July 2011, London, UK - Samsung Electronics Co. Ltd., today announces that following the success of the original Galaxy S II released in May this year, the popular handset will now also be available in white in the UK from the 1st September 2011. The sleek and stylish Galaxy S II is the first handset to offer Samsungâ€™s Super AMOLED Plus screen technology, the largest, brightest and most colourful screen available in Samsungâ€™s portfolio of devices. Super slim (8.49mm) and lightweight (116g) Samsungâ€™s Galaxy S II runs on Android 2.3 (Gingerbread) and is super-fast thanks to its dual-core 1.2GHz processor. The deviceâ€™s exceptionally bright screen makes it perfect for watching movies and TV or playing games and looking at apps, with its ground-breaking â€˜organicâ€™ LED technology, Super AMOLED Plus also saving energy so you can enjoy watching content without affecting the battery life. The Galaxy S II is built for multi-tasking, its dual-core processor makes switching between applications and loading web pages such as Google, Yahoo and YouTube quick, whilst superior 3D hardware means games and videos can be loaded and played with ease. Whatâ€™s more, thereâ€™s immediate access to content and services such as catch up TV and movie downloads, thanks to super-fast connectivity and WiFi, with speeds up to 21Mbps which provides increased download speeds, and Bluetooth 3.0+HS which reduces data transfer times significantly. Simon Stanford, Managing Director, Mobile, Samsung UK and Ireland said: "Sales of the Galaxy S II have surpassed all expectations since its release in May this year. The arrival of the Samsung Galaxy S II white brings to market an incredibly stylish addition to our latest multi-award winning handset. The Galaxy S II is our slimmest, lightest, fastest and now whitest smartphone, the first device to offer Super AMOLED Plus screen technology, alongside the most advanced technical specifications including the latest Android OS and a dual core processor." The Galaxy S II also features an 8 megapixel camera with 1080p HD recording and playback, Samsungâ€™s patented AllShare technology so you can share pictures, movies, and music with other devices and Samsungâ€™s new Kies Air which lets people manage their smartphone contents from their PC via local WiFi connections. A new â€˜Live Panelâ€™ feature on the Galaxy S II allows aggregation of live web, social networking and application contents to a single customisable home-screen, whilst itâ€™s possible to place all the important parts of your life onto three adjacent home screens which you can switch between simply by pressing and holding on the screen. As with all the Samsung Galaxy family, the Galaxy S II features Samsung Hubs, providing a huge range of entertainment content, advanced mobile games and the ability to manage social networking accounts. 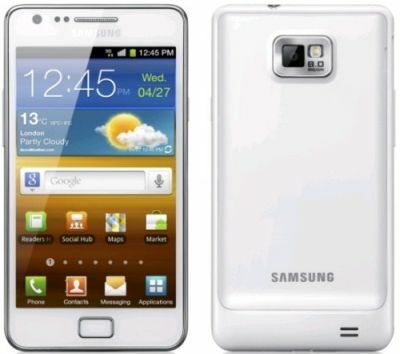 The Samsung Galaxy S II white will be available in the UK across all major networks and retailers from 1st September 2011.